I personally like France a lot – a potentially controversial statement to make for a lot of British (especially amongst some of my workmates). 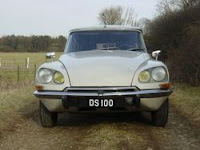 I guess this may be something to do with my Dad’s keen interest in Citroen cars – we had a totally bizarre Citroen DS Safari in the late 70s. Or maybe it’s because I like their approach to food, public transport, public services, culture etc. However, even I was surprised to hear that at one point in the late 50s a “serious” proposal was made by the French prime-minister Guy Mollet that France and Great Britain merge. Most people have scoffed at this, but in a sense, a more subtle merger is occuring with the EU, the number of Brits buying houses in France (about 500k?) and the number of French coming to work here. This is clearly viewed by most as a positive thing, but the thought of either us would give up our head of state or compromise on our great national instutions seems unlikely given the number of Xenophobes in bothe countries. Of course there’s already been plenty of comentry on it – including a post by Cyberleader Daz and a very amusing, amiable and positive discussion on Channel 4 News between Jon Snow (and his top quality ties), Raymond Blanc and P.Y.Gerbeau. Blanc was very positive about our food – and rightly so! British food has, potentially, an awful lot to offer. Our pop music (as they both agreed) is somewhat superior to the French version. But maybe we could learn something from them about pulling off “Grand Projects” more sucessfully (e.g. Wembley Stadium and Olympics). Lets face it, France and the U.K. are like siblings – there will always be a strong bond and respect, even if we squabble from time to time and are envious of each others attributes. Maybe that’s what makes the relationship so rewarding.